I'm wondering whether a cell can start a mitosis if it lack molecules or energy to fully complete it. From what I'm reading on wikipedia the cell passes most of its time in the interphase in which the DNA is replicated and then there's the G2 checkpoint to make sure mitosis can start. However I'm not sure all of this is enough to ensure that the cell has sufficient energy to fully complete the mitosis (is the cell "fueled" in energy and molecules during the mitosis or does it has everything needed before starting it?). Edit: I'm considering this question for humans in particular, or animals in general if the answer is the same. When I speak about "molecules" I mean any atom or molecule. In other words, whether the cell needs some material intake from the external environment during the mitosis or not. If not, I consider that it has all the necessary atoms/molecules to fully complete the mitosis without any external need. The short answer: no. First, let's get an understanding of the cell cycle control system, as there are some important molecules involved in this system that regulate mitosis. Think of the control system as a series of stoplights: as you mention, there is one stoplight at the G2 phase. There are two additional checkpoints: one at G1 and one in the M (mitotic) phase, just before Anaphase. Why before anaphase? At this stage in mitosis, the cell checks to determine if all of the kinetochores of the duplicated sister chromatids have microtubules attached to them. This is to ensure proper distribution of chromatids in anaphase. Ok, so back to your question: what are some of the molecules involved, or what are some molecules that the cell might need before it proceeds? Cyclin Dependent Kinases - as the name suggests, these proteins (kinases) are dependent on cyclin in order to operate. 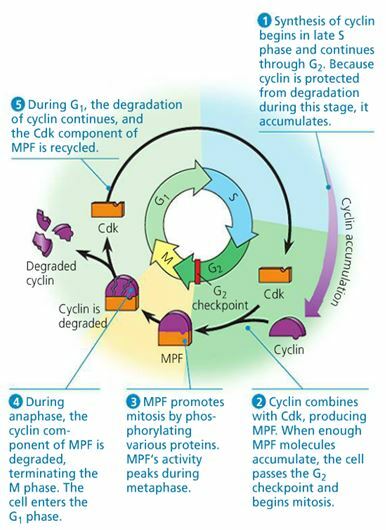 The best known Cdk is called MPF, short for maturation promoting factor. Growth factors - these are proteins specifically released by neighboring cells (relative to the cell that is preparing to undergo mitosis). These are crucial for mitosis to even initiate. A great example of a growth factor is PDGF, which stands for "Platelet Derived Growth Factor". These PDGFs are released by platelets at sites of injury, such as a cut on your knee. The PDGFs stimulate cell division and help your skin to reheal! There are many other essential nutrients that cells require before they can initiate mitosis; not all have been listed here. Also, I know I didn't necessarily answer the "energy" part of your question, but I hope this helps for your first part. Not the answer you're looking for? Browse other questions tagged cell-biology mitosis energy or ask your own question.